Republicans in House and Senate are coming back into session just as it has become clear that Mitt Romney will be the GOP nominee for President. Romney had the biggest contingent of Congressional support in the GOP primary race, but there is no evidence that support made much of difference in the race, nor is their much evidence that having that support has made it easier for Republicans to coordinate their uber-messages in the upcoming election. The fact is that House Republicans have a different world-view than either the Senate or the Romney campaign. They are both more conservative and yet they have more responsibility to govern. The Senate, by its very nature, tends to elect more moderate members but the Senate Republicans have little incentive to give Harry Reid any major legislative victories. Mitt Romney has a much more moderate track record as a Governor (owing mostly to the state where he chose to run in), and I think it is fair to say that he is much more moderate in his approach to governance. The House Republican caucus is dominated by a radical wing that finds little use in routine legislative achievements like the highway bill (which it can’t get to the House floor), or earmarks (which is how Congress’s of the past were able to get themselves reelected). House leaders have long understood that they would have to go through a long-drawn-out education process to get even the most mundane of tasks done, such as extending our national credit line and keeping the government open. But that process has not been pretty. The key for Republicans in the next several months is to be able to successfully coordinate amongst themselves so that the Romney campaign does not have to explain why the House can’t get its normal work done. 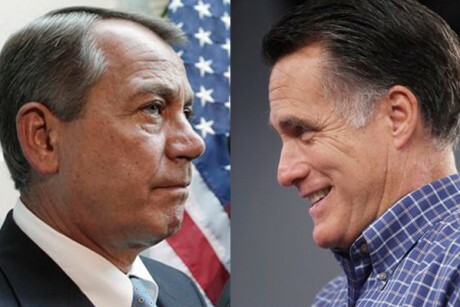 What the GOP doesn’t want is to have Romney running against both President Obama and John Boehner. Nor does it want to have three conflicting messages coming from the House, Senate and Romney campaign. This won’t be easy. It will require real coordination. Reform is the best message for the GOP. Reform of the tax code. Reform of the spending process. Reform of government procurement. Reform of entitlements. But reform doesn’t have to be radical. It can be implemented incrementally. It shouldn’t scare people. And it doesn’t necessarily have to be focused on Barack Obama. The American people have made their mind up about President Obama. They know what he has done and what he hasn’t done. They know he gives a good speech, and that he is a likeable guy. But they also know that he is in over his head as President, and that he doesn’t have the chops to cut complicated bipartisan deals with the Congress. I don’t think the Republicans have necessarily convinced the voters that they are ready to once again run the government. That is why a coordinated reform message is important. The voters aren’t going to vote the Republicans in just to replace Barack Obama. They are going to vote for the Republicans only if they are convinced that they will do something productive with the power given to them. Reform is the message for the GOP this election. And if they want to effectively deliver that message, they better start coordinating now.